Drug testing for magic mushrooms. There are a number of tests to detect psilocybin in your system. They all rely on catching you within a certain timeframe of ingesting them: Hair sample testing. For hair sample testing, 20 to 50 hair follicles of your hair are collected to test the level of psilocybin in each one. Psilocybin can stay in your hair follicles for up to 4 weeks. However, as usual, this will depend on a few factors, especially how much and how often you take these magic shrooms. Urine testing. Urine testing is the simplest test of all and involves taking a sample of your urine for analysis. Psilocybin is detectable in urine for up to 24 hours and even 48 hours if you are a heavy user. Blood testing. Blood tests look for the psilocin levels in your system are only used for research purposes. Psilocin only remains in your system from between three to five hours. It’s very rare to specifically look in your blood for magic mushrooms. Make sure you do your research before taking magic shrooms. Know your own limits, and only take a small amount if it is only your first time. Test out how these shrooms will affect you before you take too much. You may even want to enlist the help of a friend to stay straight and stay with you while you are taking a magic shroom trip. Workplace drug panel tests rarely test for psilocybin. They more commonly check for THC and methamphetamine. 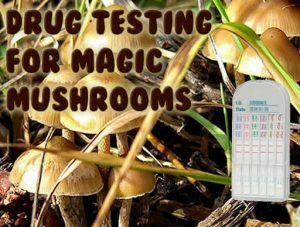 Inform yourself about magic mushroom drug tests. Know what to do when the time comes. The choice is yours. At least knowing about psilocybin drug tests puts you in a much better position that not knowing. Knowing really is half the battle. Please read our other articles for more drug test information.